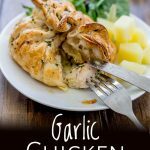 These Garlic Chicken Parcels are easy to make and look super impressive, plus they are make ahead! 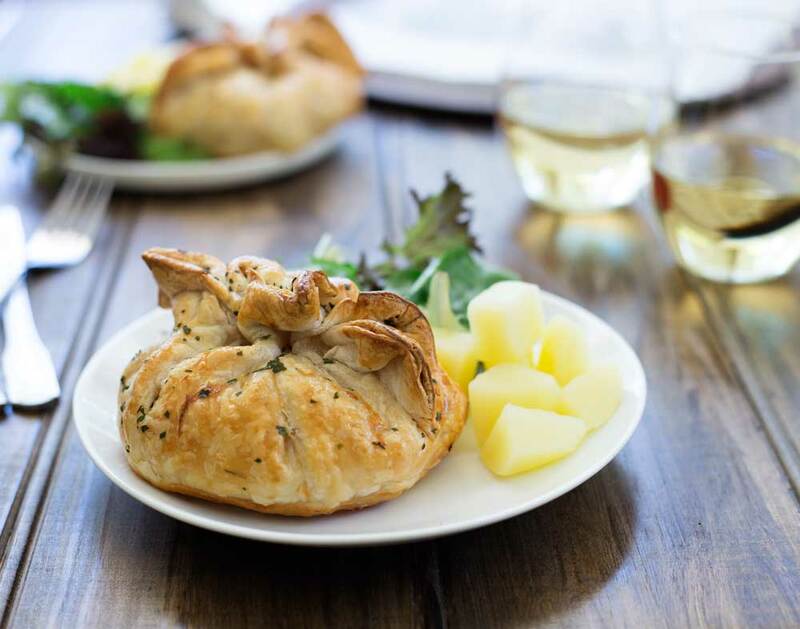 Individual puff pastry parcels (using pie crusts) are filled with juicy chicken and oozing with garlic butter. Serve with potatoes and salad for an easy weeknight family dinner, half the recipe and serve them just for two on a date night. Or they are fancy enough for entertaining and can be prepared ahead of time and then just popped in the oven to cook when you sit down for appetizers. Easy chicken dinners that please the whole family are always a winner! And these Garlic Chicken Parcels fit the bill perfectly. 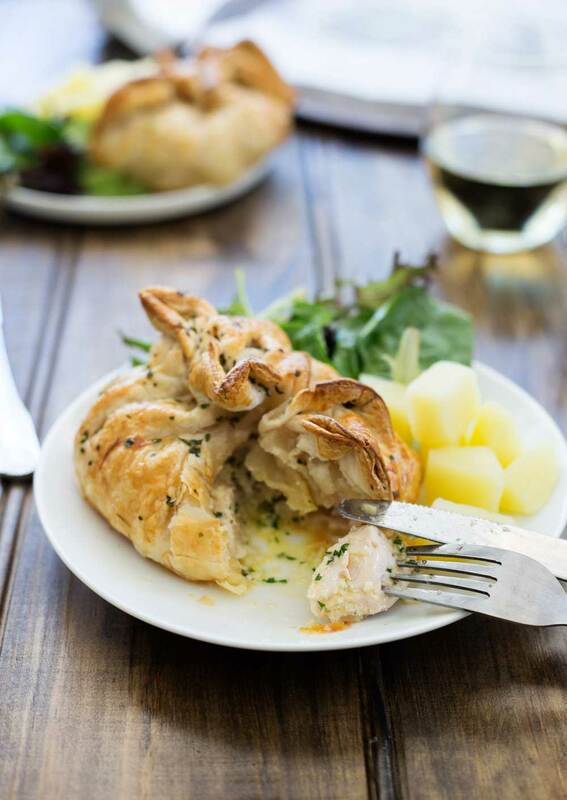 I don’t know about you, but my kids just LOVE garlic butter, so when they cut these chicken parcels open and the garlic butter flows out, they just love it. Plus the garlic butter keeps the chicken breast nice and juicy, which means the kids love the chicken too. 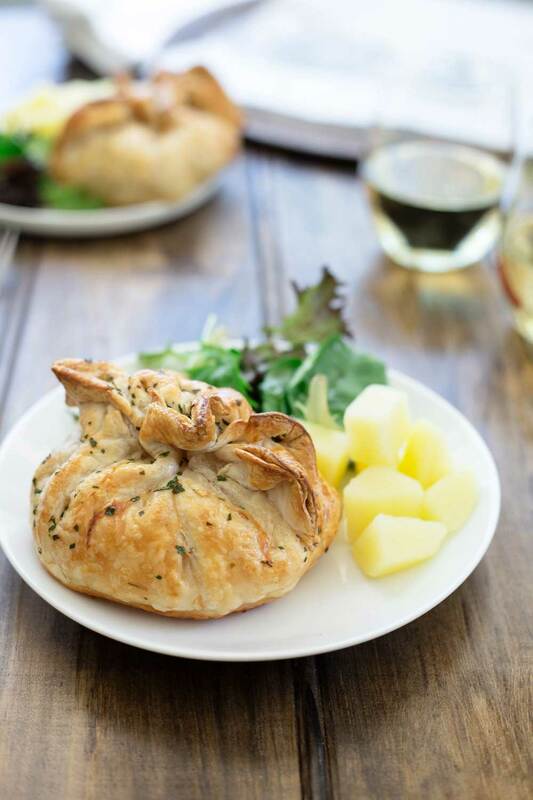 These garlic chicken parcels are wrapped in puff pastry and then baked in the oven. 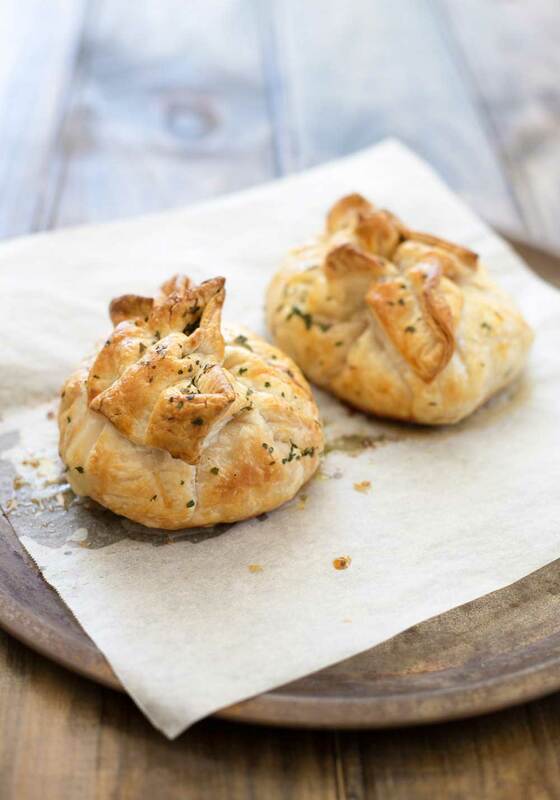 The pastry gets deliciously golden and crisp, plus it keeps all the delicious garlic butter inside. Some does soak into the pastry but that just makes it even better! You can buy sheets of puff pastry in the frozen section of the grocery store. Allow them to just defrost before you use them, but keep them on the sheet of paper as it makes it much easier to use. To make a really great garlic butter you want to start with soft butter. You should be able to push a finger into it without any resistance. You want to get the butter out of the fridge well in advance, but don’t be tempted to melt it in the microwave. You get liquid butter quicker than you can say, “where’s the garlic?” and once you have liquid butter, it never seems to taste the same. Chop the butter into small cubes and place in a non-metallic bowl. Make sure the bowl is large enough for the butter to be nice and spread out. This ensure it will soften quickly and evenly. Microwave the water for 3 minutes until boiling. Carefully remove the water from microwave and immediately place the bowl of butter inside. Close the door, to trap in the hot air, and leave for 10 minutes. Your butter will be soft but not melted. NOTE: You don’t switch the microwave on once the butter is in there. It is just shut inside with the hot air created by the water. For this recipe you want to use unsalted butter and then add salt. This is because with salted butters the salt content does vary, which most of the time doesn’t matter as you can taste the dish and adjust your seasoning. But here the butter hits raw chicken and then is sealed away until you cut into the garlic chicken parcel. At this point it is too late to adjust seasoning. So using unsalted butter and adding your own salt means you are fully in control. To ensure you get a nice neat parcel and perfectly cooked juicy chicken, you want the chicken inside to be uniform thickness. To do this you want to cut the thin pointy end off the chicken – this creates a sort of chicken breast square. You can stash these pointy ends of the chicken breast in the freezer ready for chopping up for other dinners. Pull the two opposite corners up over the chicken and pinch together gently. Repeat with the remaining two corners and pinch everything together on top. Don’t worry too much about how you gather the pastry up around the chicken. As long as there are no holes it will work perfectly. Holes are bad as you lose butter! Losing garlic butter would be very bad indeed! The chicken parcels need to be brushed with egg and then baked in a 390ºF/200ºC oven for 25-30 minutes. The parcels should be golden brown and crisp to the touch. 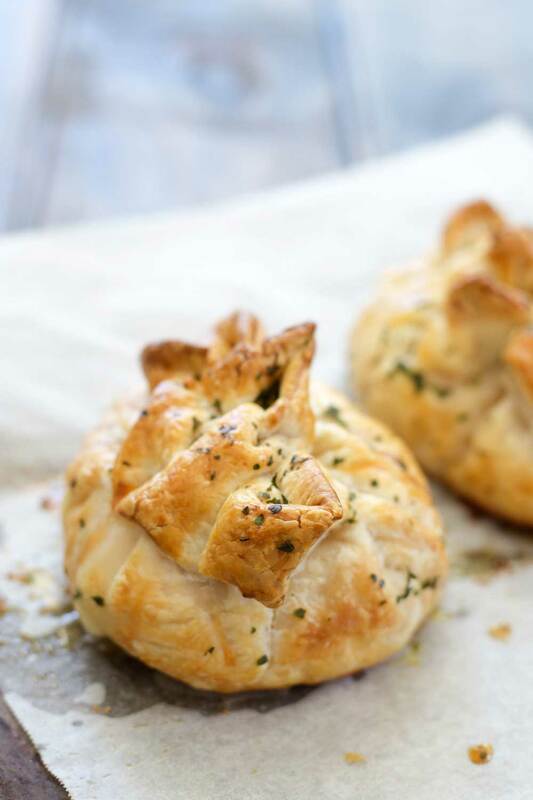 Why not pin this recipe for Easy Garlic Chicken Parcels. Pin it here. Peel the shallot/red onion and the garlic then place them in a food processor along with the parsley. Whizz until you have quite a finely chopped mixture. Use a spoon to roughly divide the butter into 4 pats and set aside. Line a baking tray with cooking paper and pre-heat the oven to 200ºC/390ºF. Lay a sheet of puff pastry out on the chopping board. I find it easiest if I keep it sat on the plastic/paper that is used to divide them. Place a chicken square in the centre of the pastry. Spoon over a pat of the butter mixture and then gather up the pastry to enclose the chicken and create a pouch. Gently squeeze the pastry closed. 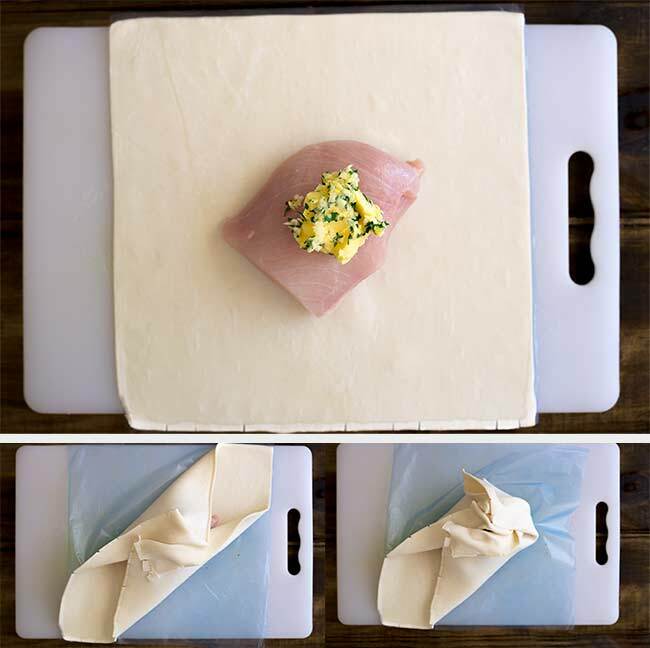 Carefully slide the chicken parcel onto a prepared baking sheet. Repeat with the remaining chicken pieces. Crack the egg into the bowl you used for the butter and whisk with a fork. Brush the parcels with egg wash and then bake for 25-30 minutes until golden brown. You want the butter to be soft enough to push a finger into it without any resistance. If you haven’t softened the butter see the bulk of post for tips on how to quickly soften butter. 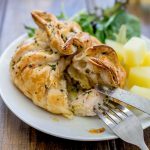 If you love food why not subscribe to my newsletter, I will drop you an email every now and then, just to say hi and send you a couple of recipes I think you might love, like these Garlic Chicken Parcels. I’m dying to make these.. but question.. it says 2 sticks of butter, does that mean 1/4 cup of butter per parcel?? Seems extreme, but who doesn’t love butter?? Oh I do hope you love them as much as we do. How far ahead can these be made? And can they be frozen before they are cooked ? I have made them 24hours in advance with no noticeable difference in the texture of the pastry. I haven’t tried freezing them, but I think as long as the chicken hadn’t been frozen before, they would be fine in the freezer. They would probably be better defrosted before cooking as I think if they were cooked from frozen the pastry would burn before the chicken cooked through.